My earliest fishing memories involve the trips my dad would take us kids on. The first trip was a Rod and gun club fishing derby at a stocked pond in a German village just outside the base where he was stationed. Although I didn't catch anything (my younger brother did); it gave me my first experience at large groups fishing small bodies of water for captive trout, and all the dynamics that go with it. I didn't catch my first trout until a few years later. We were still living in Germany and it was a Brown trout taken out of the Rhine River. It didn't matter that I caught the fish on a hook baited with a chunk of steak; it was the image of the glistening, spotted fish dancing on the end of my line that captured my heart. When we came back to Canada in the early seventies, my dad still took us out fishing, but now I was old enough to go out on my own. We lived in Prince Edward Island, and there was a great little spot for Brookies about a mile away from our house where a creek crossed under the Trans-Canada highway. I spent many long hours catching and attempting to catch these fish that lived in a pool that was so small, you could just about jump across it (if you had enough of a running start)! It was in P.E.I. that I saw my first fly fisherman. My brothers and I were dunking worms for stocked rainbows in Scales pond one day without success. As I was till fairly young and my patience not quite honed yet, I took to wandering downstream. For a while I watched fisherman attempt to catch Gaspereaux at the base of a dam, but soon lost interest in this activity, as they didn't fare out much better. I headed further downstream and came upon a solitary angler, fishing in a way that I had never seen before. The whole scene was one of graceful fluidic motion, and quite wonderful for a young boy to see, but more importantly; he was catching fish! This was the defining point in my quest to become a fly fisherman. However, the road was not without potholes and tollbooths. The first challenge was attempting to get equipment. The local hardware store had some equipment, but the salesman's knowledge of fly-fishing was akin to mine. As well fly selection was based upon what appealed to me vice any consideration on the part of my quarry. Luckily the Brookies that I predominately fished for didn't seem to mind that my fly of choice was a size 8 fan winged Green Drake. Moving out to Alberta in 1979 brought out my equipment and technique limitations. Gone were the intimate beaver ponds that I was accustomed to. That's not to mean that there aren't any here, it's just that now I had many other choices to choose from. Anything from Pothole lakes, to spring creeks, to freestone rivers faced me. All in all, it was quite overwhelming. There were two events that occurred sequentially that ensured I would not veer off the road leading to fly fishing satisfaction. One was joining the Edmonton Trout Fishing club in 1986. Up until that point, if I became frustrated in my fly-fishing technique, I would put away my fly rod and take out my spinning gear. Shortly after joining the club, we had a 'Limber your Line' night where experienced members paired off with less experienced (read me) members. The guy that I was paired with was able to work my fly rod in a way that I had never been able to. He also gave me some equipment tips that greatly helped. The net result was that I could now effectively use the gear that I had. The next milestone was pairing up with a small group of anglers in the club collectively referred to as 'the predators'. Most influential, at least to me, was a man named Bob Cormier. Why he let me tag along, I have no idea, but he soon became a good friend and my mentor. It was Bob that taught me how to read the water, and then fish it properly. The lessons that he taught me were invaluable later when I started guiding. In fact, it was his comment on my evolved fly-fishing abilities that gave me the confidence to start guiding. We spent many holidays fishing our favorite waters together, and enjoying shared discoveries. For a while work and physical location separated us; but we were brought back together in 1999 in the Crowsnest area of Alberta. While separated from Bob, the time passed quickly, as my days were spent developing the business and my family (in unequal portions). In 1994 I officially registered Streamside Adventures and became the guided first fly-fishing company based in Edmonton. I also felt at this time that I should give back a little of what I had received, and started a project in 1995 to develop a fly-fishing program with Edmonton Public Schools. As if that wasn't enough, I also started working with the Alberta Tourism Education Council in 1997 to develop national standards for Freshwater Fishing Guides. This paid off greatly, as in 1998 I became the first nationally certified guide in Alberta. 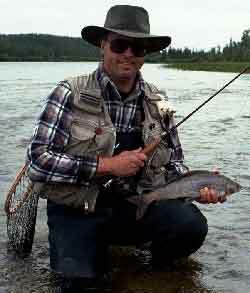 In 1997, I also started to write fishing articles for the Edmonton Sun's Outdoor section. I had always had an interest in writing, and this opportunity seemed the ideal forum to test my abilities out. I helped form the Alberta Sportfishing Industry Association in 1998 and dove in by accepting an executive position. In July of 2000 I made the big move from Edmonton to Calgary. This new location now allows me to be closer to the foothills streams that are my second home. That same summer saw me take my two future fly-fisher girls Brynne and Jenna out into Kananaskis country for their first camping/fishing trip, and although they didn't catch anything, I know that I have planted the seed that could develop into the same love for the outdoors that I have. And if they happen to catch some fish, that will be OK as well.